The Neurocalometer was invented and has been developed on the postulate that a subluxated vertebrae causes pressures on a nerve or group of nerves as they pass through or emit from spinal column. The instrument has taken that principle out of the field of theory and placed it strictly in the realm of science. In other words, it has furnished proof the principle is correct. The instrument not only shows when pressure is present, but whether it has been completely or partially eliminated as a result of the Chiropractic adjustment of the causative vertebra. When a vertebra is subluxated, it causes pressure on the surrounding tissues of a nerve or a bundle of nerves and this causes resistance to flow of nerve energy. This resistance in turn causes heat at that point, as heat is produced when resistance is added in a circuit carrying electricity. Neurocalometer is so sensitive and so constructed with thermocouple detectors and galvanometer that it registers heat and records it as so many points, or units, on the dial. It makes comparative heat readings of the spinal area . In the original version, a long cord connected the hand-held thermocouple portion to a meter housed in a walnut box. In later models, the meter was housed in the hand-held device. B.J. espoused (and insisted upon leasing) the device so vigorously that many of his supporters became alienated . In the late 1950s, researchers from the Stanford Research Institute surveyed chiropractors in California and concluded that about 12% used a neurocalometer and that it was commonly referred to as a "nerve meter." The researchers also tested the instrument and found that the readings were greatly influenced by how hard the thermocouples were pressed against the skin . The Nervo-Scope, a neurocalometer descendant, contains a battery, a meter, and thermocouples at the end of its twin probes. Its findings can be recorded by connecting the device to a strip-chart recorder. During the 1970s, one supplier's catalog said that the device was "taking its place alongside the x-ray in importance" . However, a chiropractic monograph stated that "unreliability and lack of scientific documentation" have prevented widespread use of heat detectors in chiropractic practice . A 1993 Canadian chiropractic consensus conference concluded that paraspinal measurement with thermocouple devices "has not been shown to have good discriminability, and both their validity and reliability of measurement are highly doubtful." This is a politically correct way of saying that the devices are clinically worthless. Nervo-Scope is used and respected for its EFFECTIVE Spinal Analysis, by the Leading and Successful CLINICS, COLLEGES, SEMINARS, and Thousands of CHIROPRACTORS . . . 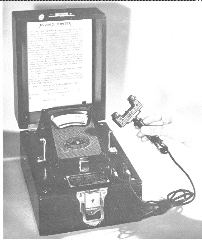 Since 1943. . . .
Nervo-Scope detects subluxations . . . and provides the Reliable PRE and POST Adjustment Readings, that Produce the Most Beneficial Patient Results. . . .
Nervo-Scope will quickly pay for itself in under One year. If you use Nervo-Scope on ONLY 8 patients per day . . . your Cost per Patient, for TOTAL PAY BACK, is only 25 Cents Per Patient for One Year, is the Benefits, which you receive from SATISFIED PATIENTS and CONTINUAL REFERRALS. . . .
Nervo-Scope is an AUTOMATIC PRACTICE-BUILDER . Accurate Spinal Analysis requires you to make decisions. With the ANALAGRAPH you can take the guess work out. Now you will be able to compare Pre-check readings against your Post-check readings. Now, you can accurately determine Patterns, and see when Check-out has occurred [sic]. ANALAGRAPH makes it Easy to see Subluxations that might otherwise have been totally missed . The purpose of skin temperature analysis (e.g. Temp-o-scope, Nervoscope) is to obtain objective neurological evidence of a vertebral subluxation complex [VSC]. . . . The method for conducting the exam is dynamic scanning. A bilateral skin temperature difference is depicted as meter needle movement to one side or the other. The "reading" . . . is considered significant if an abrupt "over and back" needle movement is seen over a one spinal segment distance. The amount of the temperature differential is thought to be directly proportional to the amount of neurophysiolgic involvement due to the presence of VSC. The spinal subluxation in the acute stage often reveals a large variation in temperature. . . . Monitoring the intersegmental heat differential is one of several parameters of assessing and gauging patient progress in response to specific spinal adjusting . Palmer BJ. Neurocalometer research. In Palmer BJ. Our Masterpiece (1961), pp 89-93. Republished by Kale Foundation, Spartansburg, N.C., 1993. Stanford Research Institute. Chiropractic in California. Los Angeles, CA: The Haynes Foundation; 1960: pp 71-72. Nervo-Scope: Performance proven practice builder. Model ETS-6. Undated flyer, distributed Nov 1998 by Electronic Development Labs, Danville, Virginia. Photo of "brain stem specialist" doing "skin temperature differential analysis"
This article was revised on May 18 2008.